The expansion of individualized “private space” due to the gradual decline of inherited status. An increase in the acceptance and circulation of the idea that a man’s personal character could be expressed via the characteristics of his garden. Tao Yuanming in His Garden. Detail from the handscroll Tao Yuanming Coming Home. 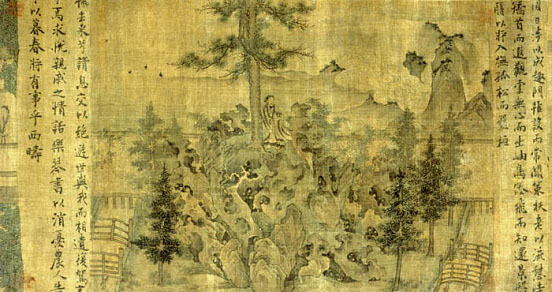 Painting in ink and colors on silk, 12th century. Courtesy of the Freer-Sackler Galleries, Washington, DC. By the eleventh century, Chinese intellectuals had developed the theory that a man’s private garden, like his painting or calligraphy, could express his inner character and feelings through its selection of scenes and its general style (e.g., natural, showy, or ornate). Underlying this idea was the literary theory that poets could express feelings through their description of a “scene;” thus, it was easy for artists and garden designers to map gardens onto literary theories already fashionable in China. For example, the fourth-century poet Tao Yuanming had written a famous poem about leaving official life to go home and to live simply and freely in his house and garden. A twelfth-century poet produced a painting based on this poem and divided into a number of “scenes.” One of these shows the poet in his garden. In keeping with garden taste of the time, the poet is able to look at beautiful distant mountains that lie outside the bounds of his property. His “natural-looking” bridge is made of rough wood without fancy carving, and he stands on a rock carved naturally by wind and water, rather than on an artificial rock created by a sculptor. His only friends are the bamboo and the tall pine on which he leans. In all these ways, the artist lets us know that Tao Yuanming is truly “Mr. Natural” himself. During the seventeenth and eighteenth centuries, the Manchu emperors of China often had paintings made that illustrated life in the palace. Among these paintings, many show the emperor or palace ladies enjoying themselves in the imperial gardens. This was something of an innovation because imperial portraits were not an important genre in China as in Europe. In Europe, portraits of nobility were very common and would have been seen by court dignitaries and other nobility, although the settings tended to be highly formalized and anything but casual. In China, court portraiture also existed, but after the development of expressive theories of art in the eleventh century, portraiture lost its status as a proper subject of high art (a fate it shared in Europe and North America also after the development of expressive theories in the nineteenth century). 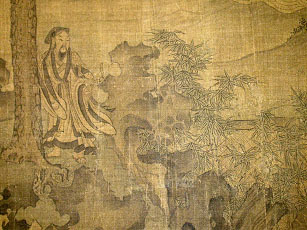 Therefore, paintings of emperors are rare, that is, until the Qing Dynasty. The Qing emperors had a different attitude and often represented their residences via literature and the arts: poetry, paintings, prints, and illustrated books. They also enjoyed having their portraits painted with realistic detail. Most of these images were kept for their own pleasure within the palace. They could hang such paintings on the walls or look at them in albums or handscrolls. But, they also had special printings made that they distributed to state officers or visiting dignitaries as gifts so that others could understand better the kind of taste that characterized the Manchu Imperial Court. 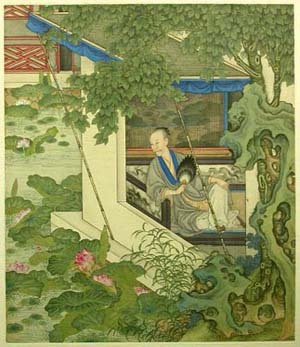 Emperor Yongzheng in the Role of a Literatus Enjoying His Garden. Courtesy of the Palace Museum, Beijing. This genre of painting probably met several political and personal objectives of the Qing emperors. One reason could be to show that they had successfully adopted the culture of the majority of the Han Chinese, who were not Manchus, as well as that of the Chinese intellectuals who had long been fond of showing themselves lounging casually in their home environment. Another reason could be that some Qing emperors, especially Emperor Qianlong, wanted to master all the arts of a Chinese literatus, as if his imperial rank alone were not enough to earn him the respect of the educated public. Thus, because Chinese literati liked to collect art, Emperor Qianlong amassed a huge collection; because Chinese literati liked to write poetry, Emperor Qianlong learned to write poetry; and because they liked calligraphy, Emperor Qianlong became skilled in calligraphy. Likewise, successful Chinese literati often had beautiful, if small, gardens, and Emperor Qianlong may have wanted to go the extra mile to show he could do it even better. Still another very important reason may be that Emperor Qianlong, like other monarchs of that period, wanted to say something about the accomplishments of his nation as depicted in images of himself that could be seen by foreign dignitaries, as well as by important domestic persons.